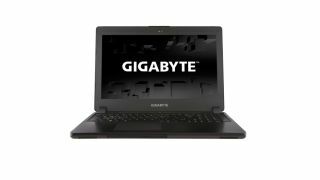 We've seen gaming laptops go on a diet this year, and now Gigabyte is claiming to have outed the world's lightest device in its category. Aimed at gamers and 3D designers alike, the company describes the 15.6-inch P35K Ultrablade as a machine that "exudes elegance and sophistication delivering a professional laptop but geared for gaming". If Bond took a laptop to a LAN party, this might be it. It spans 21mm thick and weighs 2.16kg - a touch heavier than Razer's similarly-specced Blade 14 (1.88kg) that landed back in July - which isn't surprising what with it carrying an extra inch of heft. Specs wise, the P35K houses up to 16GB RAM, a fourth generation Intel Core i7 processor, and an Nvidia GTX 765M mobile GPU packing 2GB RAM. The display itself is a wide angle 1080p IPS panel. It beats the Blade 14's 1600 x 900 pixels and could be lifted above Razer's offering if you place resolution and screen real estate high on the agenda. The P35K also comes with hot swappable bays that support up to two 512GB mSATA SSDs and two 1TB HDDs that provide 1000MB/s and 850MB/s read/write capability. It also features support for Super RAID 0. There's no word yet on UK pricing or availability yet.